The climax of the celebrations of 30 years of the United Nations Convention on the Rights of the Child, this three-day conference will take place in the Palais des Nations on 18-20 November 2019. These three days of debates, dialogue, questions and proposals are intended to be an opportunity to highlight the programmes being implemented in Geneva to support children’s right to mark the 30th anniversary of the Convention. 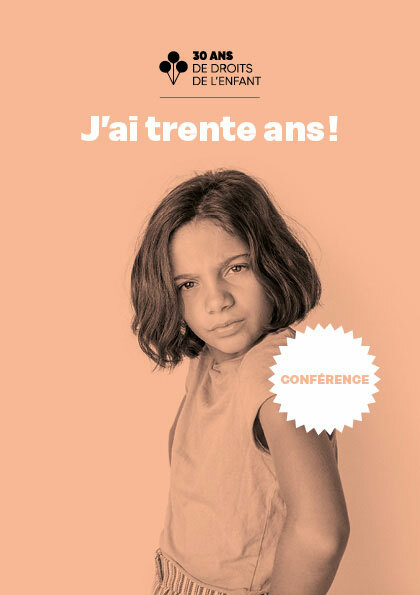 Children’s-rights professionals, institutions, bodies and academics in the city and international organisations of Geneva and in the Swiss Confederation will come together in the same place for the first time, to mobilise and maximise the wealth of knowledge, skills and expertise that Geneva has to offer. As well as being open to professionals and institutions, this three-day conference will be open to the public and anyone with an interest will be able to follow and take part in the debates through multimedia channels and social media. All the plenary sessions will be filmed and it will be possible to follow them live via the Facebook page of the Association. Online interaction with the public will be possible. Throughout the event, Child Reporters will interview the participants and speakers (video or radio), and will comment on the event online every day. Through thematic workshops with smaller groups, it will be possible to tackle specific issues in depth before heading back into the plenary to make the most of the resulting cross-pollination of expertise and suggestions. The conference marking 30 years of the United Nations Convention on the Rights of the Child is the result of a partnership between the Thirty Years of Children’s Rights Association, Mission of Switzerland to the UN in Geneva, the United Nations Office at Geneva, the Office of the United Nations High Commissioner for Human Rights, UNICEF and many more.